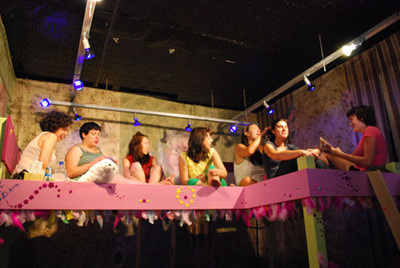 Slumber Party involved a large-scale installation of four oversized, interlocking bunkbeds was utilized to re-enact the familiar childhood experience of a girls slumber party. 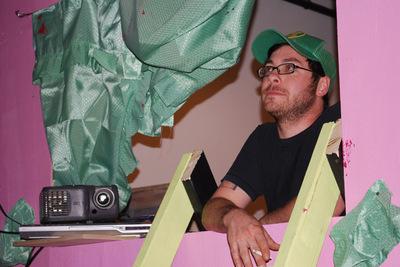 Audience members could peer and sneak through a window into the installation space to join the fun. 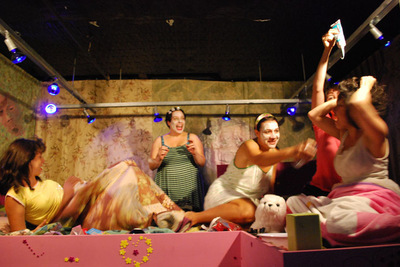 This piece was performed at English Kills Gallery on August 16-17, 2008 as part of Maximum Perception: Contemporary Brooklyn Performance, curated by Peter Dobill and Chris Harding. Other performers included Iwalani Kaluhiokalani, Michelle Morby, Natalya Krimgold, Robin Lehto and Juri Onuki.